If you were tuned into Parliament TV just after 10pm last night you might’ve seen the Isle of Wight MP speaking about cross-Solent travel. Mr Turner had already been involved in discussions to ask for Government assistance in considering options for the future of Island Line, and during an end-of-day ‘adjournment’ debate in the House of Commons last night, he sought and won agreement for the wider Island transport infrastructure to be included, including the ferry services. The debate and request to the Government was prompted by private negotiations between the ferry companies and businessmen working on the Better Ferry Campaign, described by the MP as ‘constructive’. Discussions had taken place with the Minister in advance of the debate and informal meetings with the Isle of Wight Council also encouraged the Island’s MP to seek what he called a ‘win-win solution’ to the long standing cross-Solent issues. 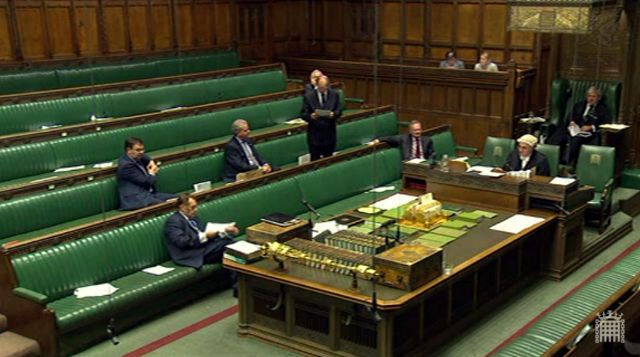 During the debate, John Hayes MP, Transport Minster praised the Island’s MP for his ‘extraordinary dedication’ to seeking a solution to the Island’s connectivity problems, both behind the scenes and more publicly. He said his colleague had made a ‘persuasive case’ for the Government to support the holistic approach called for and invited the MP to work with the Council to prepare terms of reference, so that the plan can be taken forward. During the debate some of the dangers of the current business model were outlined, with the ferry companies changing ownership for ever-increasing sums, leaving higher and higher debts that can only be serviced from fares or cutting services and costs. Mr Turner also described how the recent transfer of business from Wightlink to Red Funnel, (which has led to Red Funnel overtaking Wightlink as the most popular route to the Isle of Wight), could destabilise the market, and eventually lead to even bigger problems. “In the past the competition authorities have looked at the cross-Solent ferries and although they recognised potential problems, decided in 2009 that it was too soon to make a judgement on whether the very high prices paid and resultant debt levels would have an nadverse effect on prices and services. “I believe that if they look again at the ferry companies they would certainly find the proof they would need to act. If necessary we will go down that route again. But what was true in 2009 still holds true today – there is no easy answer that can be imposed by a regulator. It doesn’t mean there would be no action – but it may not lead to the intended outcomes. You can watch the footage on Parliament Player. 18 Comments on "Ferry services to be included in transport infrastructure taskforce says MP"
What a shambles – Five members present, including one asleep. Speaker struggling to keep awake; and the speech…If this is democracy God help us. I agree Labour would give us better representation, but so to will UKIP. You think anyone will take the bloke who thinks bringing back cottage hospitals is a good idea seriously? You seriously think that if it was McKie who called this debate there would be anyone else listening to him? This is how parliament works. The only time there is anything approaching a full house is at PMQs and when the whips order their members in. Otherwise it’s like a pub at seven o’clock on a tuesday night. If it works then OK, if he doesn’t pull it off and make it open to all parties then we condemn it as a ruse. I realise you are a new poster here Mrs D, but good manners dictate that you have the courage to identify yourself when you make such personal attacks? If not, you seem to be one of those ghastly trolls we read about.